I’ve been aware of Shaken Udder milkshakes for quite some time. Their cartoon cows and bold packaging make them difficult to miss when I’m in the refrigerated section of the supermarket! 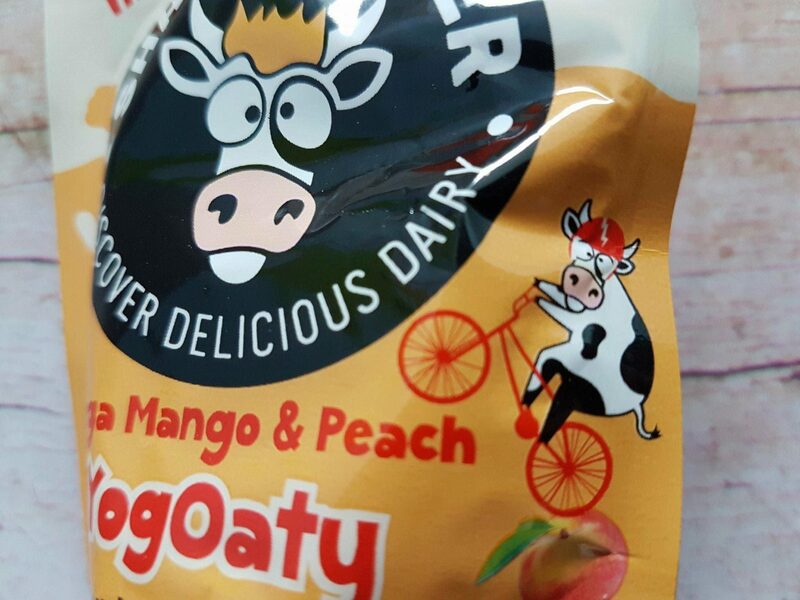 Recently, they’ve launched YogOaty pouches. These are tasty pouches you can take out with you for a snack, pop in lunchboxes or have as part of breakfast. Autumn has been a good little tester as always. As you’ve seen on the blog this week, she loves trying bath time things, but food is her most favourite thing to try! She’s tried out all three flavours over the last few weeks either as a snack or as part of her breakfast. I like how small they are to take out with me to play groups or the library. These bold little pouches contain British yoghurt, real fruit and oats. 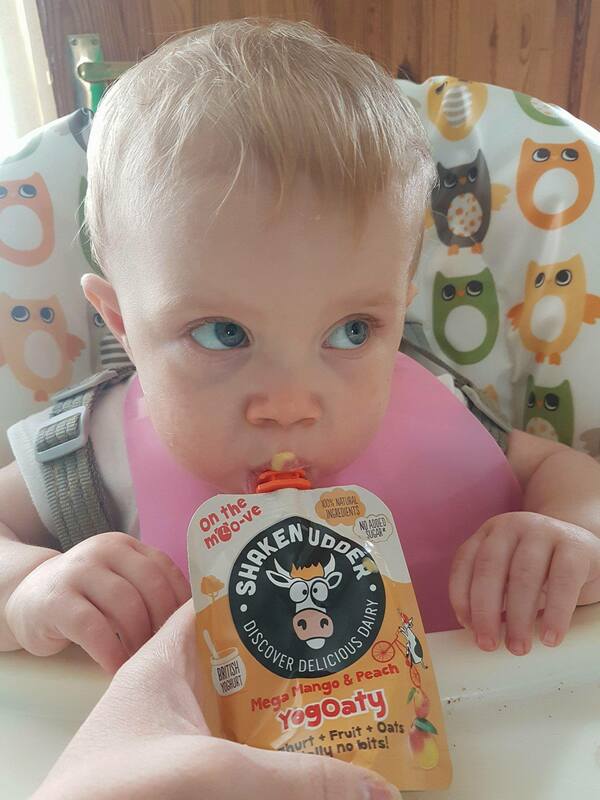 They don’t contain any bits (good to know for fussy kids) and are made of 100% natural ingredients. On another important note, no sugar or sweeteners are added to them. They’re also suitable for vegetarians. Autumn doesn’t really seem to have a preference. She likes them all! As I mentioned, they’re really compact which makes them great for taking out with you! I love the design of the pouches too. They look fun enough for children to want to eat them and not realise that they’re *gasp* a healthy snack! They’re a fantastic source of calcium which is so important for growing little people! Each flavour has a different funny cow on its pouch too, which is guaranteed to get a giggle! They have a spout which makes eating them easy and not overly messy! As Autumn is so young, I usually feed her them using a spoon. However, she’s happy to use the spout in a pinch too. We thought these were fantastic and will definitely be looking out for them in our local supermarket. What do you think? 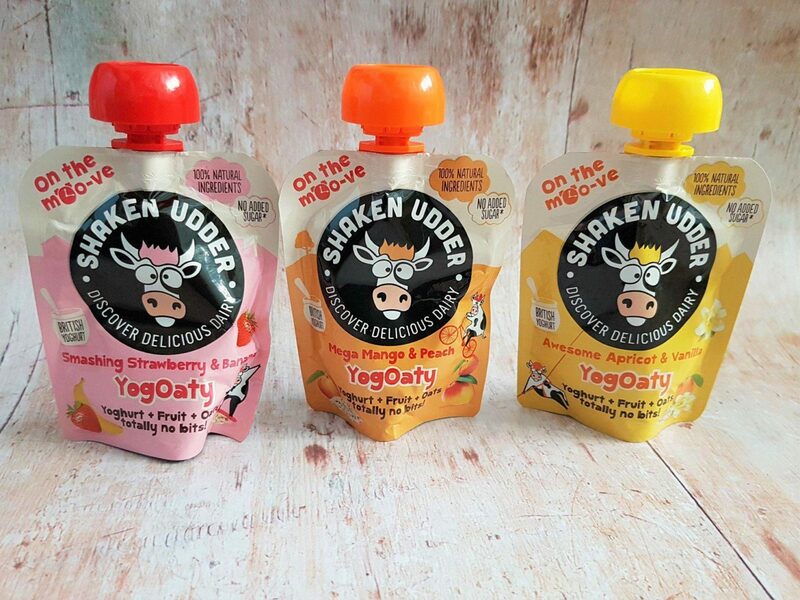 Disclosure: We were sent 6 pouches of Shaken Udder YogOaty for the purpose of this review. As always, all views and opinions are honest and my own.